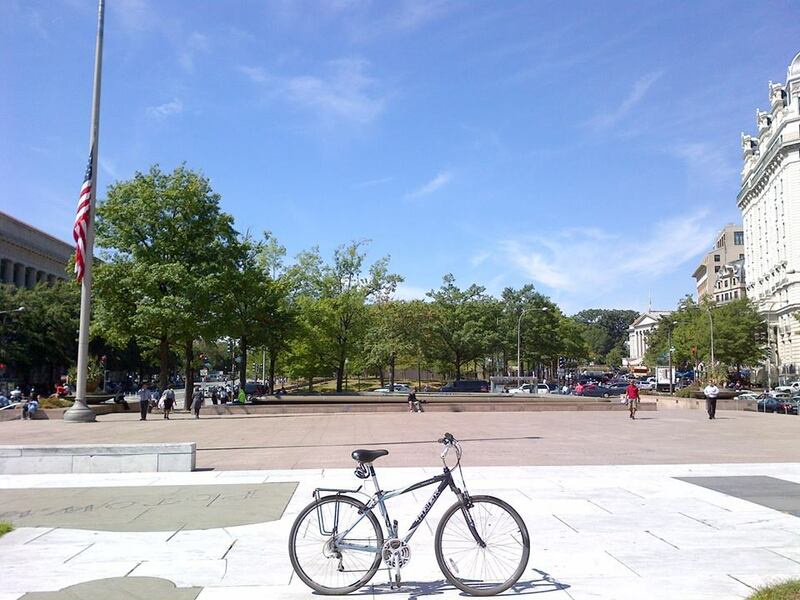 Freedom Plaza, originally known as Western Plaza, is an open urban plaza built in 1980 in northwest D.C., located at 1455 Pennsylvania Avenue (MAP), at the corner of 14th Street and Pennsylvania Avenue. 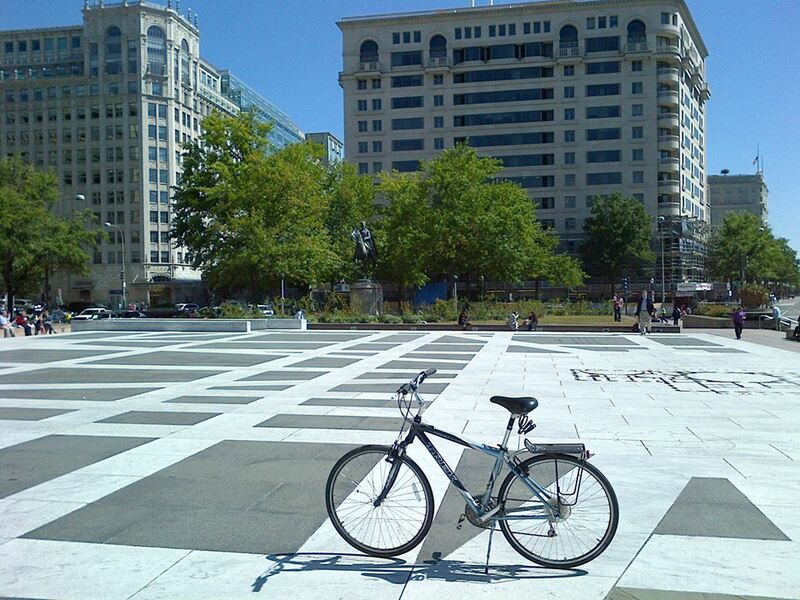 It is adjacent to Pershing Park, and just a few blocks from The White House. 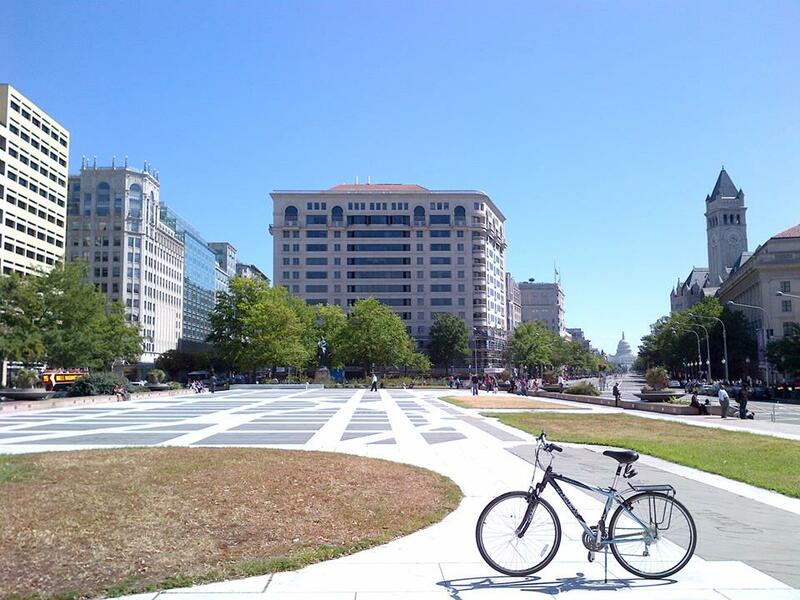 The plaza was designed and developed by The Pennsylvania Avenue Development Corporation, as part of a plan to transform Pennsylvania Avenue into a ceremonial route connecting the U.S. Capitol Building and the White House. The western end of the plaza contains a raised reflecting pool with a large, animated circular fountain, while the eastern end contains an equestrian statue of Kazimierz Pułaski, a general in the Continental Army. The center of the plaza contains a giant inlaid black granite and white marble map of the national capital city, as designed by Pierre L’Enfant, with grass panels representing the National Mall and the Ellipse, and bronze markers denoting the U.S. Capitol Building and the White House. 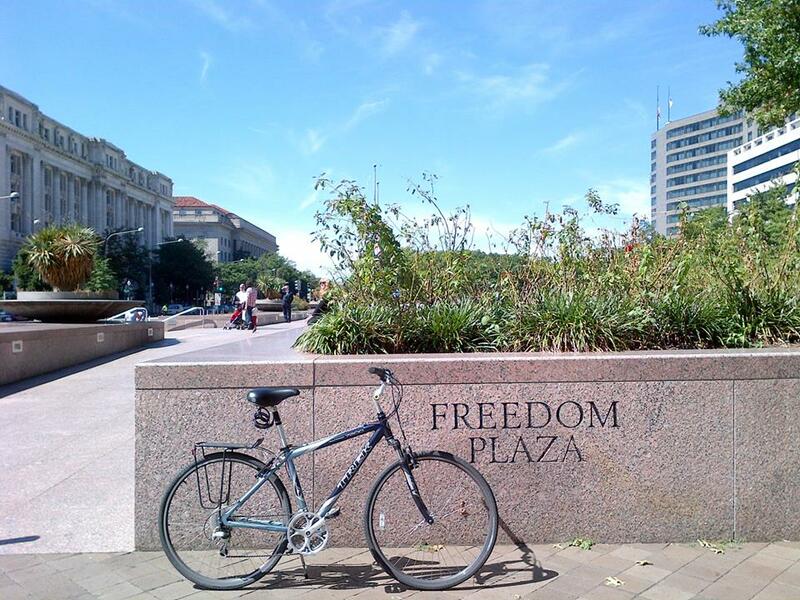 It was renamed Freedom Plaza in honor of Martin Luther King, Jr., who worked on his “I Have a Dream” speech in the nearby Willard Hotel. At the time the name was changed in 1988, a time capsule containing a Bible, a robe, and other relics of King’s was planted at the site. 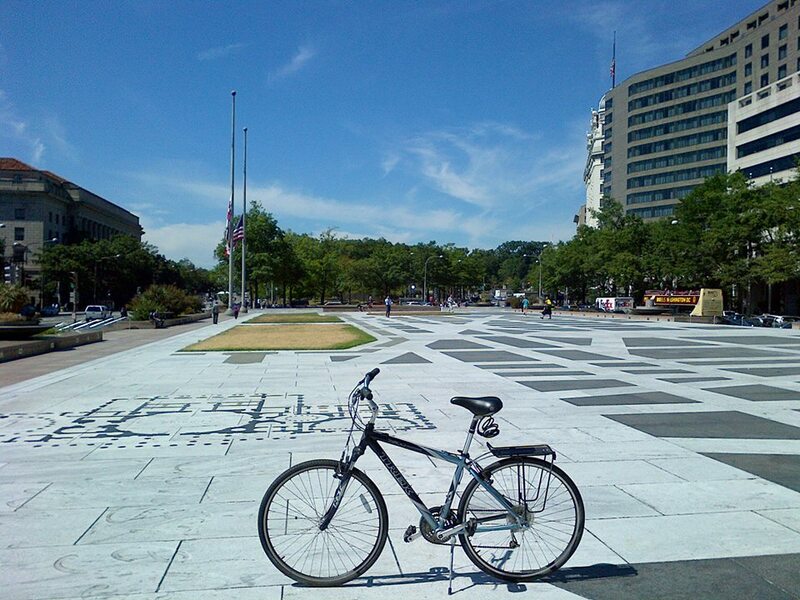 I look forward to another bike ride there in 2088 when the time capsule will be reopened. 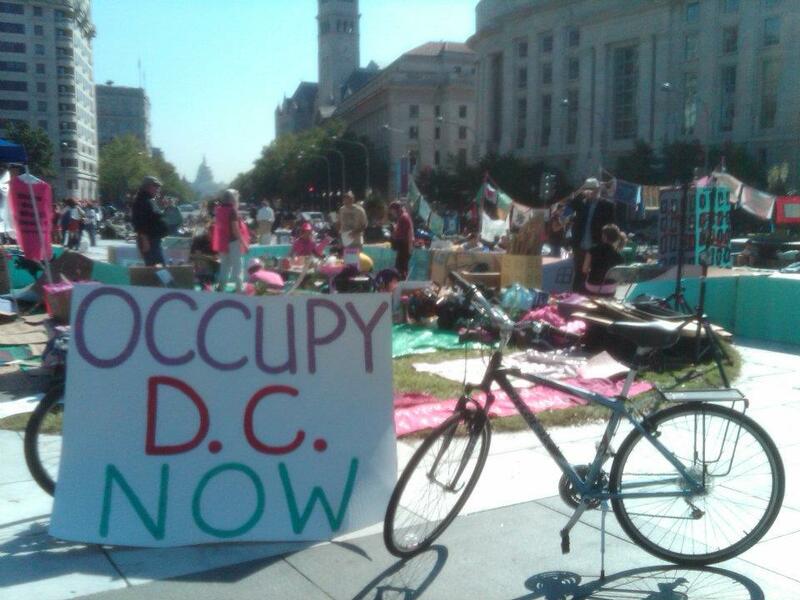 Freedom Plaza is a popular place for political protests and civic events. In the spring of 1968, it was home to a shanty town known as “Resurrection City,” which was erected by protesters affiliated with Martin Luther King, Jr.’s “Poor People’s Campaign.” In the wake of King’s assassination on April 4, 1968, the encampment ultimately proved unsuccessful, and the inhabitants of the tent city were dispersed within the next couple of months. 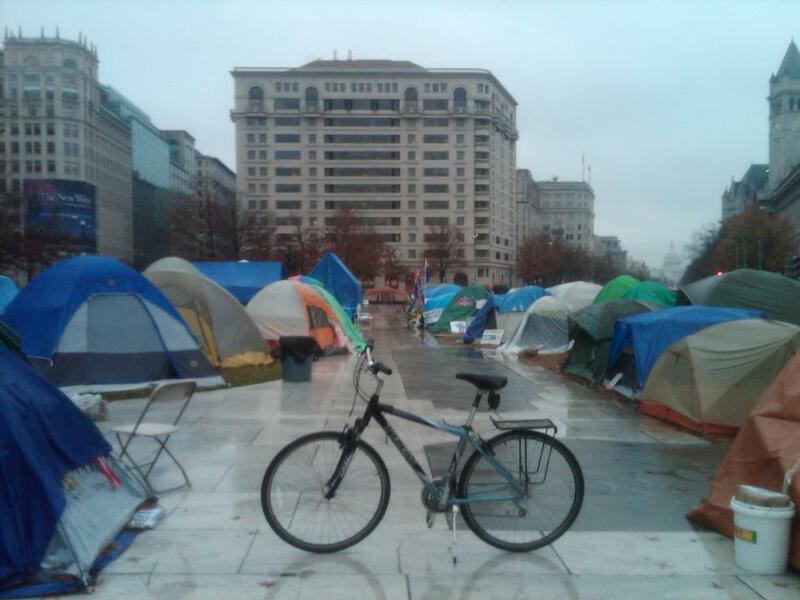 Freedom Plaza is one of those places in D.C. that many people have already been to but never really noticed. Unique among the city’s plazas and parks, it is worth a long enough visit to appreciate its subtlety and details. 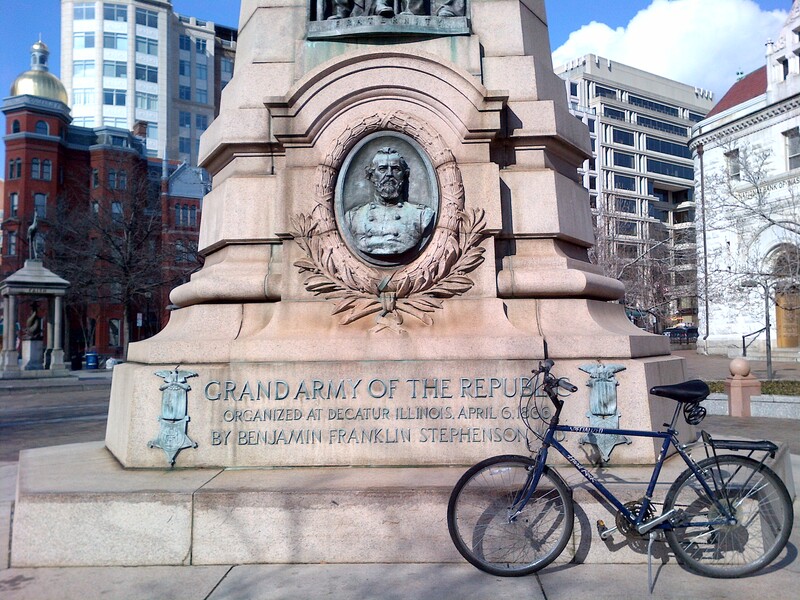 One of the last remaining Temperance Fountains, an ornate reminder of an outdated and failed social movement, can still be found in D.C. 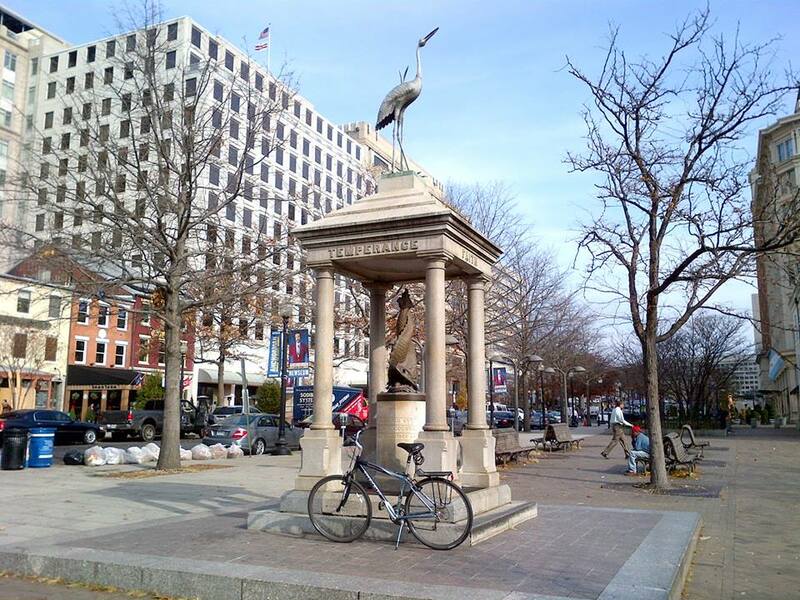 Originally located downtown at the corner of Pennsylvania Avenue and 7th Street, it was moved to its present location in 1987 during the renewal by the Pennsylvania Avenue Development Corporation. 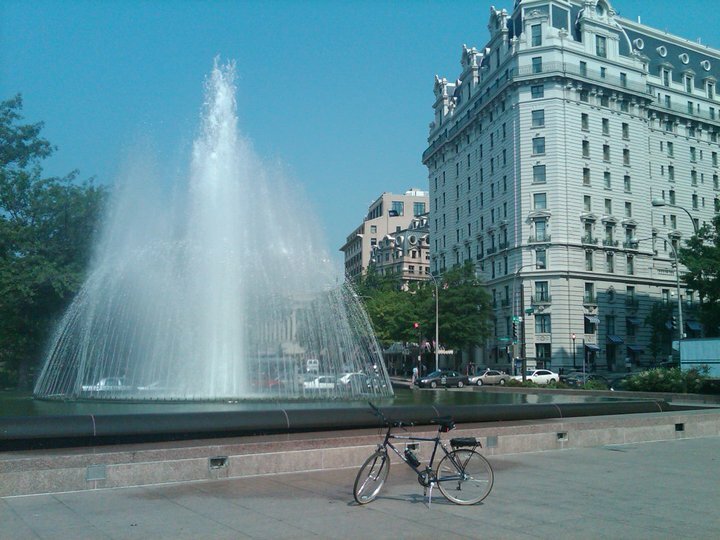 The fountain currently sits at the corner of Seventh Street and Indiana Avenue in northwest D.C. (MAP), across from the National Archives Building and U.S. Navy Memorial, where thousands of tourists and workers walk past daily without noticing it. It was erected and donated to the city in 1882 by Henry D. Cogswell, a dentist from San Francisco, who was a crusader in the temperance movement. The fountain was one of a series of fountains throughout the country that he designed and commissioned in a belief that easy access to cool drinking water would keep people from consuming alcoholic beverages in one of the many nearby saloons. The fountain is an elaborate structure built of granite that Dr. Cogswell designed himself. It has four granite columns supporting a canopy on whose sides the words “Faith,” “Hope,” “Charity,” and “Temperance” are chiseled. On top of the structure is a life-sized heron, and the centerpiece is a pair of entwined dolphins from which ice water once flowed from their snouts. Other fountains he designed were adorned with frogs, pigeons, sea serpents, horses, and gargoyles. A few even sported a bronze statue of Dr. Cogswell himself, with a water glass or temperance pledge in his outstretched hand. Passersby could partake using a brass cup attached to the fountain, and the overflow was collected by a trough for horses to drink. The city got tired of replenishing the ice in a reservoir underneath the base and disconnected the water supply pipes many years ago. Today it remains as a non-functional memorial to the defunct temperance movement. These grandiose statues were not well received by the communities where they were placed. The fountain in San Francisco was torn down by a mob of self-professed art lovers, while the one in Rockville, Connecticut, was thrown into a lake. Although the Temperance Fountain in D.C. remains unscathed, it was considered so ugly by so many that it spurred city councils across the country to set up fine arts commissions to screen such gifts in the future. 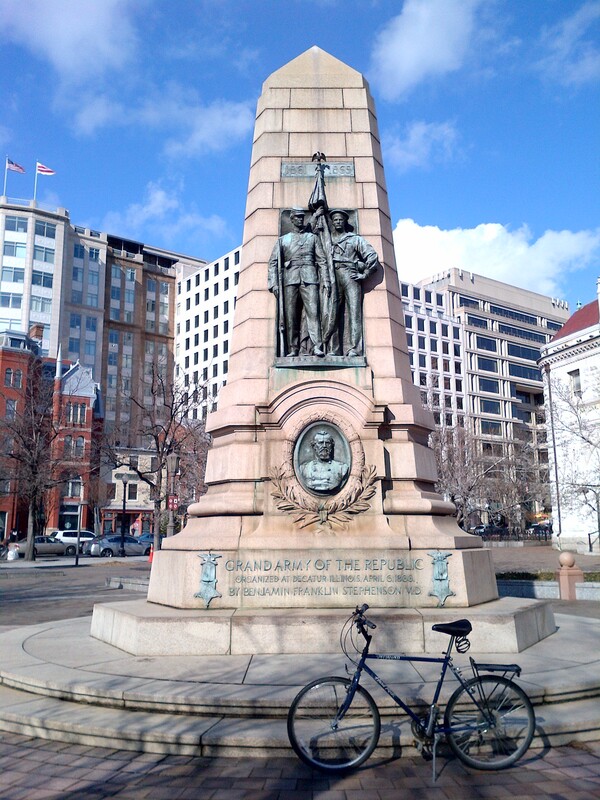 However, despite the opposition, the D.C. statue has been placed on the Downtown Historic District National Register, as well as U.S. National Register of Historic Places. 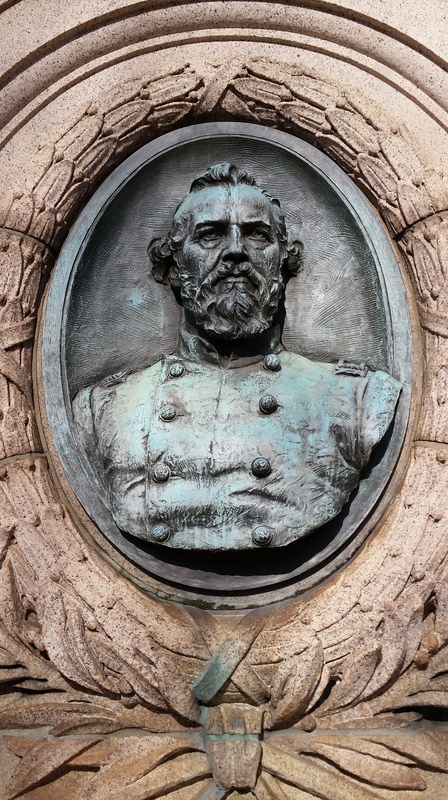 Dr. Cogswell built similar monuments which can still be found in Tompkins Square Park in New York City, and in Rockville, Connecticut. Other examples were erected and then torn down in Buffalo, Rochester, Boston Common, Fall River, Massachusetts, and Pacific Grove, San Jose and San Francisco, California. During the Civil War, a humanitarian named Clara Barton had a discussion with her father in which he convinced her that it was her Christian duty to help the soldiers. She subsequently went on to help gather and distribute medical supplies, food, and clothing to soldiers during the war. She even gained permission to work on the front lines, where her work gained support from other people who believed in her cause. These people became her patrons. Eventually, with the support of her patrons, she went on to be appointed as the “lady in charge” of the hospitals at the front of the Army of the James. At the end of the Civil War, Barton continued her work by hiring a staff and opening an office to provide assistance to grieving parents, family and friends whose sons, brothers, neighbors were missing. 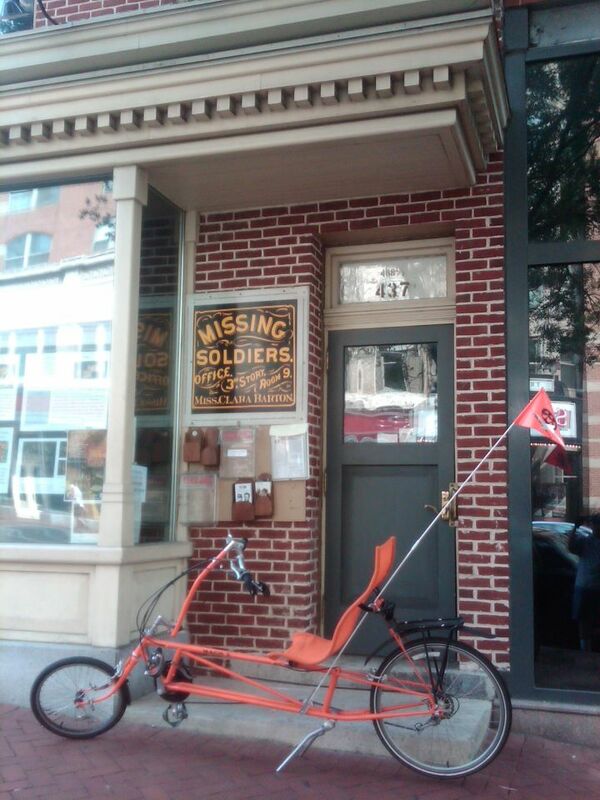 It was named the “Office of Correspondence with the Friends of the Missing Men of the United States Army.” Also referred to as the Missing Soldiers Office, they responded to over 63,000 letters, most of which required some kind of research. The research then led to published lists of the names of the missing so that anyone with knowledge of their whereabouts or death could contact Barton. By the time the office closed in 1867, she had identified the fate of over 22,000 men. Barton, along with another humanitarian named Adolphus Solomons, would later go on to found the American National Red Cross, an organization designed to provide humanitarian aid to victims of wars and natural disasters in congruence with the International Red Cross. Over a century later, in November of 1997, the U.S. General Services Administration (GSA) discovered signs, clothing and papers in the attic of 437 Seventh Street in northwest D.C. (MAP). The vacant building had recently been transferred from the Pennsylvania Avenue Development Corporation for sale by the GSA and was slated for demolition. The artifacts were identified as the belongings of Clara Barton from her occupancy of the building during the Civil War, while she was providing supplies to soldiers on the battlefields, and immediately following the Civil War, when she operated the Missing Soldiers Office out of Room 9 on the third floor. As a result of the discovery, the building was not demolished as planned. Instead, it has been preserved by the GSA, which retains an easement for a planned museum in the future.